450 years ago a little boy was born in an ordinary, or perhaps typically picturesque, part of the rural Midlands. His mother, Mary, and his father, John, brought him up in a house in Henley Street. And although these were troubled times and their lives weren't easy, their son grew to become immortal. The Heritage Lottery Fund estimates that tourism is now worth £26.4bn to the UK economy. In 2011 it was estimated that 4.9m people a year visit the Stratford-on-Avon district, adding around £335 million per year into the local economy. Locally, around 8000 jobs are dependent on the Shakespeare factor. The Stratford-on-Avon Destination Tourism Strategy is seeking to re-establish Stratford-upon-Avon in the top 20 UK towns and cities for domestic and international visitors. Stratford-on-Avon isn’t the home of culture vultures – it’s the birthplace of the Cultural Tiger Economy. 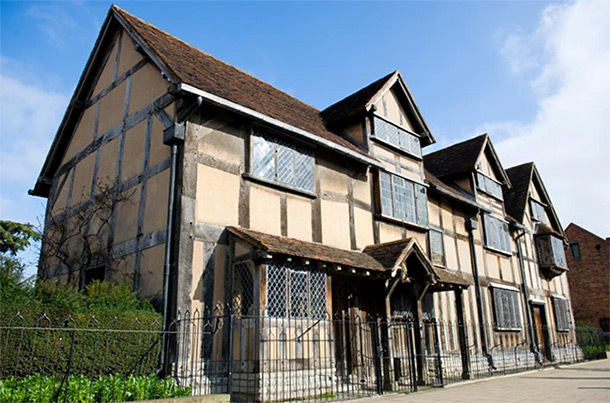 The Shakespeare Birthplace Trust is the independent charity that cares for the heritage sites in Stratford-upon-Avon. In 2013 they welcomed more than 818,000 visitors from every continent to the five Shakespeare family homes in Stratford-upon-Avon. And that’s just the town where Shakespeare was born. Aside from the plays and poems and his second home, The Globe Theatre in London, Shakespeare has created an entire academic discipline supporting English departments throughout the world. His words are studied everywhere. They stand outside political and social divisions. They connect a global audience to brand Britain through culture. Shakespeare is for everyone and so everybody is for Stratford Upon-Avon. It’s impossible to put a value of on the true value of the UK Shakespeare economy. One thing is certain, a great deal the cash that changes hands is between people who have never sat through a performance of ‘Much Ado About Nothing.’ Shakespeare appreciated the importance of a good joke. Through his ability to dodge being pigeon-holed he, and a few others like him, created the first literary franchises. A search of the UK IPO’s database reveals a little over 100 Shakespeare trade marks in a variety of ownerships. They protect the name from infringement of high culture, beer, wine and even half marathons (the Shakespeare Half Marathon is the registered trade mark of The Rotary Club of Stratford Upon Avon ). Shakespeare lives – he’s not some entombed old poet – dried up and crushed by weight of his and his supporter’s pretentions. True he gave us Hamlet- but do remember that that became a cigar – the cigar brand ‘Prince Hamlet’ was first registered in 1963. It’s the kitsch of living in the real world that breathes life into the global Shakespeare industry today. That – and the plays and poems, of course. It’s perhaps worth remembering that anyone wanting to register their own Shakespeare trade mark should take care. The field of play is full of competitors. Some with registered marks and others already trading in this competitive market. Establishing a niche will require savvy thinking. But if there is another Shakespeare out there - perhaps you’ve already picked up your quill. As soon as you’ve finished your sonnet – the copyright is yours. How you manage your name is up to you.